This is the second cake I made for my Mom's birthday. At a German birthday party you usually can not have too many cakes. So, she even made another one herself. 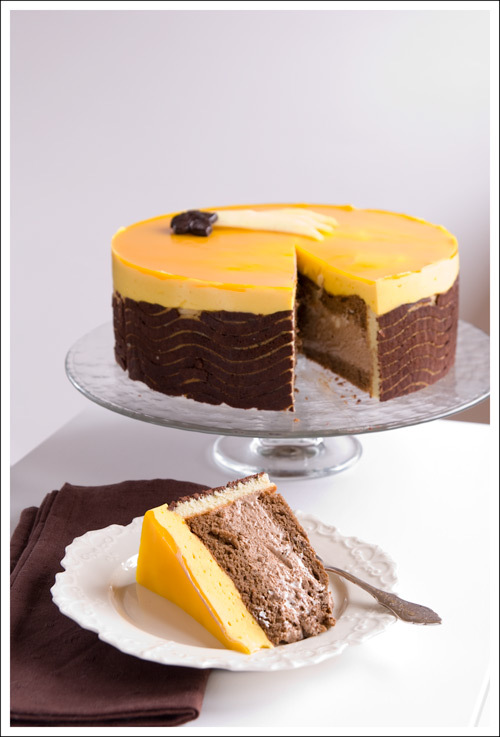 I wanted to make a mango-chocolate cake since I ate one in Vienna last year. I made a decorative joconde to wrap around the cake, but I think next time I would do it without. The whole cake got a little bigger than I wanted it to be. It was really huge. The cake still tasted delicious. I especially liked the chocolate mousse. I don't know if it was the use of the immersion blender, but it had a really nice consistency. Instead of the mango mousse, which was also very good, I want to try a passion fruit mousse next time. I think the tartness of passion fruit would go very well together with the chocolate mousse. It takes some time and several steps to make this cake. Plan accordingly, since you have a few cooling cycles. I would recommend you bake the joconde (if using) and sponge the day before, and also make the chocolate mousse. Then you can start to assemble the cake. This way it has enough time to set overnight. The next day, when you serve the cake you have just the mango mousse and glaze to make. detailed description and recipe on my post "Biscuit Joconde Imprime with Apple, Lemon and White Chocolate-Rosemary Entremets"
Preheat the oven to 160° C (325° F). Line a 24 cm (9-inch) springform pan with parchment paper. Melt the chocolate over a water bath. Let cool a little. Separate the eggs. Whisk the egg yolks with 25 g of the sugar until the mixture turns frothy and pale yellow. Add the melted chocolate to the egg yolk mixture and stir to combine. Also add the almonds. Beat the egg whites until soft peaks form, then add the remaining 100 g sugar and beat until glossy and stiff. Fold into the chocolate mixture. Bake for about 40 minutes. Let cool on a wire rack. Melt the two kinds of chocolate over a water bath. Whisk the egg yolks until creamy. In a small saucepan warm up the 50 ml heavy cream with the orange liqueur until almost boiling. Stir in the instant gelatin (if you use regular gelatin you have to soak it first). Then add the melted chocolate. Using an immersion blender mix everything together until smooth. Then add the egg yolks (the chocolate mixture should still be warm). Let the mixture cool a little. Whip the heavy cream until stiff peaks form and add to the chocolate mousse, when it is just starting to set. Cut the cooled chocolate sponge lengthwise into two layers. Put one layer on your cake plate. Put a cake ring around it. If using the decorative joconde put it around the chocolate sponge. Fill the chocolate mousse on top of the cake, then add the second cake layer. Put in the fridge to cool for at least one hour. To make the mango mousse start with soaking the gelatin sheets in cold water. In a bowl over a water bath whisk together the egg, egg yolk and sugar. Keep whisking until the mixture reaches about 70° C (158° F) and it starts to thicken. Take off the water bath and pour the mixture through a sieve. Add the gelatin sheets and stir until they have dissolved. Add the mango puree and whisk until combined and the mixture starts to cool down. Whip the heavy cream until soft peaks form and carefully fold into the mango mixture. Pour the mousse on top of your cake, and put in the fridge to cool for at least 3 hours. For the mirror glaze soak the gelatin sheet in cold water. Heat the water and sugar in a small pot until boiling and the sugar has dissolved. Add the mango puree and take the pot off the heat. Now add the soaked gelatin sheet and stir until it has dissolved. Let cool until lukewarm. Carefully pour over the cake and let set in the fridge for about 2 hours. 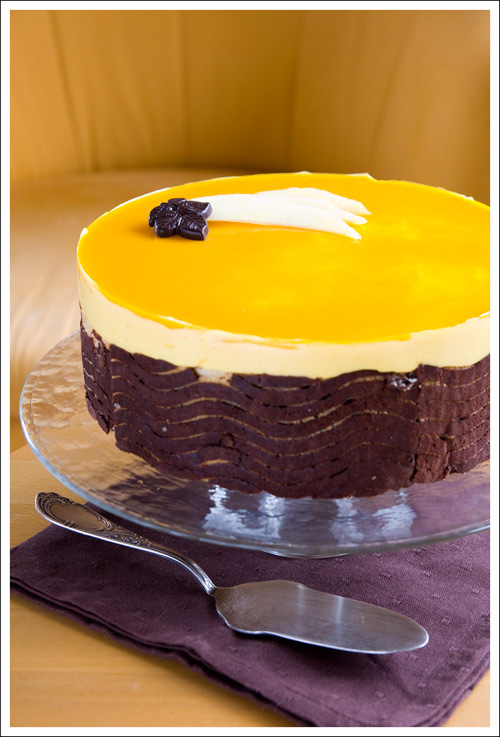 Remove the cake ring before serving and decorate with some fresh cut mango slices. Lemon Celebration Cake for my 100th post!